Manual water softener which can be used on small dishwashers and glasswashers and has 1800 litres typical softening capacity. 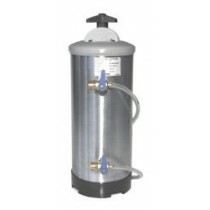 This water softener is simple to install and no electrics needed. The system works by manually flushing the resin beads with a salt solution (2kg salt) as required. This water softener system helps to prolong the lifespan of your dishwasher and glasswasher if your business is in a hard water area.